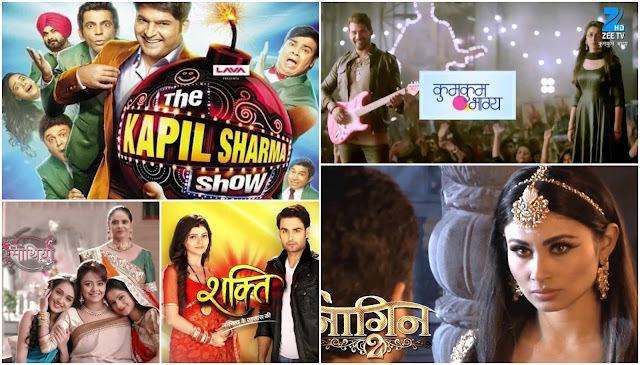 2016 was great in terms of Indian TV Channels with some new conceptual TV shows introduced. And the most important part, the Indian audience who were the regular viewers of Saas Bahu Saga also started watching the new shows with different concepts be it Supernatural or Youth Oriented. Naagin: The Naagin season 1 in 2016 broke all the TRP records, this year Naagin Season 2 still leads the TRP charts in the weekends. The powerful part of the revenge drama is the storyline which will force you to watch the episodes every week because if you miss one you can’t understand the next one. Indeed well written and impeccable performance by the cast : Mouni Roy (protagonist in season 1 & 2), Arjun Bijlani( Season 1), Karan Vir Bohra (Season 2), Sudha Chandran( Antagonist in season 1 & 2) The chemistry between Arjun & Mouni lead top TRP ratings, Lets see if this season also has some good chemistry between the leads. Shakti Astitiva Ek Ehsaas Ki: This Colors serial within some months have created a storm in the TRPs. Main reason of the popularity of the strong social message about a transgender life which was never touched or raised by any TV shows till now. How the society treats a transgender, her feelings and her love. The popular show also has Vivian Dsena and Rubina Dilaik in the lead roles. These two actors have huge fan following in India and overseas also. Let see how the ongoing plot changes and the lead pairs unites. Saath Nibhana Saathiya: This Star Plus show is the oldest serial in the list which started from 2010. The show has every Masala which the TV lovers love to watch specifically the housewives. The serial has Saas Bahu Saga, Family drama, Love between the lead pairs, Fights between siblings everything. But day by day it is losing it’s charm due to no perfect storyline. May be it’s the last year the show is airing. The lead pairs of the are Devoleena Bhattacharya, Mohammad Nazim. The Kapil Sharma Show: The only Talk show which made to the top charts of BARC 2016. The famous and well known comedian Kapil Sharma made a news when he left Colors TV show “Comedy Nights” with his full team. Than started a war between the shows, but like we said talent always prevails. Kapil Sharma's ardent followers plus the Indian audience all over the world put the show in the top. Still the shows haven’t lost it’s charm with soft comedy and funny takes by the characters. Kapil Sharma have always made clear that the success of the show is not of an individual ,it’s a team effort. Well we wish all the luck to TKSS for more success.